Please, enter the text shown in the image above. Are we crazy for offering free service? Absolutely not! We know that most business owners are honest people who simply want good dependable IT service. We are not going to ask for money to prove that we are the best at what we do. 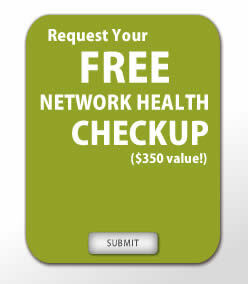 Register below so that we can schedule your FREE Network Health Checkup. Click here for a check list of what we will do when we come to your office. Only the yellow fields are required. *Limited Area for checkup – usually within 100 mile radius.